These little ships of Bayview, with their sails as white as snow. The little ships of Bayview, with their sails as -white us snow. On the little ships of Bayview, with their sails as white as snow. Many would attest that our first songs came out with the first ships as sea shanties. From earliest days we have had a vast range of musicians and composers, many of whom may have supplemented their income composing and selling music. The Victorian era brought innovative forms of dance to add to traditional waltzes, including the Gavotte, which originated as a French folk dance, taking its name from the Gavot people of the Pays de Gap region of Dauphiné where this dance was first danced. Experts in the field of collecting Sheet Music state that more rare or older documents attract higher figures, as do those autographed by their composers or their performers, many of whom are still popular. The Cover Illustration will fetch more attention too, especially among archivists or those who collect these for their historic value. People use Sheet Music as decorations for hearth and home, framing them or creating a collage to brighten up walls. They are, of course, the record referred to when musicians interpret the music of long ago in order to perform. Music was often dedicated to a certain person, usually because they were a patron and supporting the artist financially, or the artist hoped they would. For example, Nadezhda Filaretovna von Meck, a Russian business woman who became an influential patron of the arts, especially music, is best known today for her artistic relationship with Pyotr Ilyich Tchaikovsky, supporting him financially for thirteen years, so that he could devote himself full-time to composition. Tchaikovsky dedicated his Symphony No. 4 in F minor to her. She also gave financial support to several other musicians, including Nikolai Rubinstein and Claude Debussy. In times when young ladies were being educated at home, one of the 'accomplishments' required to be part of 'society' was that of playing the piano. 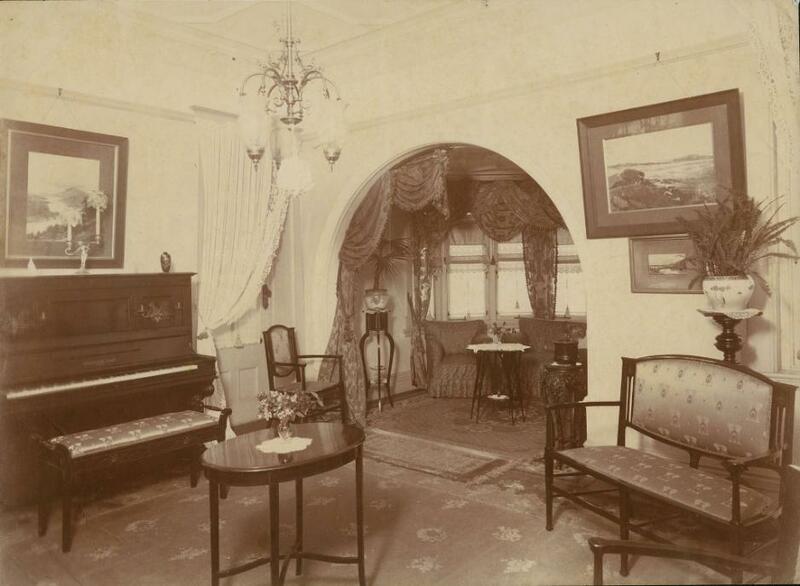 The social rounds were composed of 'at homes' where tea and cakes may be served but also, where the piano or other forms of musical instruments were played. A constant stream of music, new music, thus had an audience and a market. Collecting Sheet Music is more interesting if you know a little about the provenance of the piece and the people behind it – that way, if it’s not valuable due to its rarity, it has other values not restricted to Mammon which ultimately are where true worth actually resides. One that caught our interest as it reminded us of the beautiful place in Pittwater called ‘Bayview’ once ‘Bay View’, is a gavotte written and dedicated to a student. 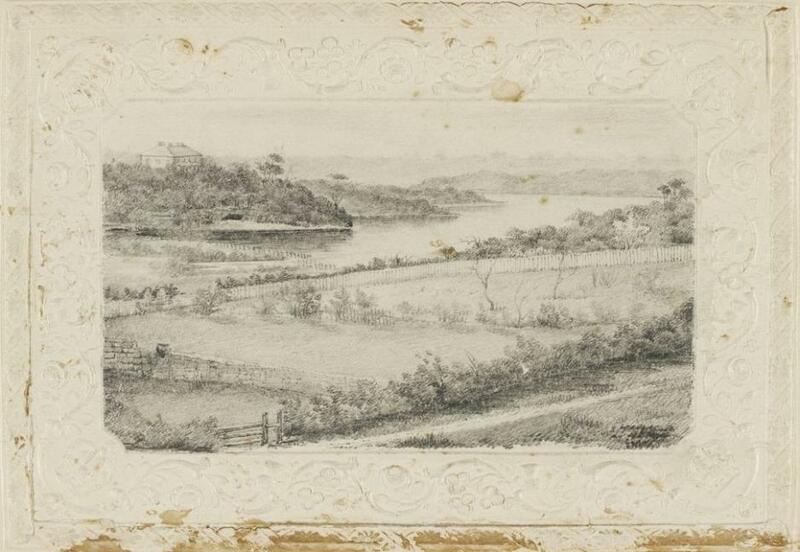 The title actually refers to a home overlooking Glebe Point, George Well’s ‘Bayview’ and the student was one of his many children with wife Sarah (nee Goddard). The Gavotte has on its back Cover a W H Paling reference to Lord Carrington, Governor of New South Wales from December 11th 1885 until November 1890, indicating the time the work was published in. The student the work is dedicated to is Lena Wells, fourth and youngest daughter of George and Sarah Wells, born December 11th 1877, who could have only been 8 or 13 when this work was produced. George Wells, a Glebe Alderman from 1878 to 1883, was born 7th of August 1832 at Great Yarmouth, Norfolk, England, son of George Wells. At ten years of age in 1842, Mr. Wells set out on the life of a seafarer for nine years, settling in Sydney in 1851. He rented premises at May Street Ultimo, conducted a produce business in Market Street and acquired a livestock auctioneer’s licence, before moving to the Forest Lodge Ward of Glebe in the late 1870's. Trading as George Wells & Matthews, commission agents, at the Corn Exchange from 1887 to 1901, by 1909 he was the oldest livestock auctioneer in NSW. Mr. Wells had been appointed a JP and magistrate in 1878. He married Sarah Goddard at Scots Church Sydney on 29 October 1855. Respected in the Glebe area Wells, using his skills as an auctioneer, chaired parliamentary campaign meetings for Michael Chapman, Percy Lucas and George Wigram Allen. New South Wales Births, Deaths and Marriage records indicate they had between 14 and 16 children, so even they lost some to childhood illnesses, the means to support a large household and a home full of dancing children is easily imagined. THE OLDEST PIANIST IN AUSTRALIA. It is with regret that we learn of the death of Mr. William Stanley, who was born at Windsor Castle on May 29, 1820. He was a son of the late organist of St Georges Chapel, Royal Windsor, and was educated at the chapel where he remained until 1836. He started his musical career at the very early age of six years, and at the age of 10 he played solos at Rochester, in Kent, and performed at Windsor Castle before Queen Adelaide, both of these performances being his own compositions. He was also a singer at the funeral of the late King George IV. Shortly after this Mr. Stanley joined the army, having enlisted with the 80th Regiment under the command of Colonel Pitt, of Chatham. In this regiment he served for about five years, after which he took his passage to Australia in charge of a vessel sent hereby the home Government with prisoners on board, which arrived here about the year 1837. His first performance in Australia was at the opening of the original "Victoria Theatre" in the presence of the Governor at that time (Sir George Gipps), after which Mr. Stanley acted as accompanist to the late Madam Sara Flower, the noted contralto, Miska Hansa the celebrated violinist, and Madam Anna Bishop the English soprano. He also played duos with Bolanger, the French pianist. Mr. Stanley's first appointment as an organist was at St John's, Parramatta, during the time of the Rev. H. H. Hobart, where he remained for eight years. Later on Mr. Stanley was appointed organist to the Sydney Choral Association, and held the position of bandmaster to the first volunteer artillery band. He was also first lieutenant to the South Sydney Volunteers, for which corps he organised a band on his own account. He also held positions as organist to the following churches, viz.:—St. Andrew's Cathedral for 16 years, St. Barnabas' for seven years, and Christ Church, Sydney, for 12 years. Amongst some of Mr Stanley's many excellent compositions are "Variations to God Save the King," an arrangement he wrote at the age of 8½ years; two marches, one in C minor and the other in E flat, written at 10 years of age; an oratorio, "David and the Philistines;" march and preludes to Handel's "Israel in Egypt;" numbers of church anthems and chants, and over 100 various other pieces. In addition to this he wrote a Jubilee Ode to celebrate the Jubilee of our late Queen Victoria, words by the late Edward Baly. In 1879-80, at the musical festival at the International Exhibition here, Mr. Stanley conducted "The Messiah" and "Israel in Egypt" before an audience of 10,000 people; and on the death of the late Charles Packer that composer's sacred cantata, "The Crown of Thorns," was completed by the late Mr. William Stanley. We have a collection of Sheet Music, collected more for use then for what it may be worth, but some among these songbooks are rare and not easily found items nowadays, as well as a few autographed versions. Their condition, through use, would not fetch substantial prices in any collector's market but is worth noting that if you have some old rare pieces they could be worth a lot more then you think! gavotte, lively peasants’ kissing dance that became fashionable at the 17th- and 18th-century courts of France and England. Supposedly originated by the natives of Gap (Gavots) in the southeastern French province of Dauphiné, the gavotte was danced in royal ballrooms as a round with skipping steps adapted from the branle. Couples concluded improvised duet performances by kissing their partners. Later the dance developed more formal figures, and flowers were exchanged instead of kisses. At the French court in the 18th century, the gavotte was at first stately and later more ornate; its slow walking steps were in 4/4 time, with upbeats on beats 3 and 4. In a suite the gavotte appears among the optional subordinate movements called galanteries. Its three-part composition is written in its early lusty 2/2 rhythm but retains the later two upbeats; its second section is a musette, a pastoral air in which a drone bass runs throughout. The gavotte is first described in the late 16th century, as a suite or miscellany of double branles, danced in a line or circle to music in duple time, "with little springs in the manner of the Haut Barrois" branle, with some of the dance steps "divided" with figures borrowed from the galliard. The basic step pattern is the same as for the common or double branle, with the line of dancers moving alternately to the left and right with a double à gauche and double à droite. In the double branle, each of these composite steps consists of four components: a pied largi (firm outward step), pied approche (the other foot drawn near but not quite up to the first), another pied largi, a pied joint (following foot drawn against the leading one). The basic gavotte steps differ as follows: in the initial double à gauche a skip (petit saut) is inserted after each of the four components; the second pied largi is replaced by a marque pied croisé (the following, right foot crossed over the left and with the toe contacting the floor); the final pied approche is replaced by a grève croisée (the right foot crosses over the left and is raised in the air). The double à droite begins now with a pieds joints and petit saut, followed by two quick steps, a marque pied gauche croisé and marque pied droit croisé, during beat two, a grève droit croisée and petit saut on beat three, and concluding on the last beat with pieds joints and a capriole (leap into the air with entrechat). The gavotte became popular in the court of Louis XIV where Jean-Baptiste Lully was the leading court composer. Consequently several other composers of the Baroque period incorporated the dance as one of many optional additions to the standard instrumental suite of the era. The examples in suites and partitas by Johann Sebastian Bach are best known. When present in the Baroque suite, the gavotte is often played after the sarabande and before the gigue, along with other optional dances such as the minuet, bourrée, rigaudon, and passepied. SINCE the year 1859, when Glebe was declared to bean independent municipality, to be governed by a council chosen from its residents, a complete change has occurred in its appearance and importance. At that time the houses were few and far between, and the population not very numerous. The greater portion of the land was covered by scrub and wattle trees, occupied by numerous camps of blacks, the roads were wretchedly formed, and the lower part of the township was occupied by an impassable swamp. Under the fostering care of its aldermen and councillors it has rapidly developed into one of the most populous and fashionable suburbs of Sydney, and as its distance is only two miles from the metropolis, and the character of its scenery highly picturesque, its streets well paved and in good order, and its situation high, dry, and healthy, it will no doubt keep up its reputation as one of the most desirable places of residence for business men and others who wish to spend their leisure time away from the noise and bustle of the city. Sir George Wigram Allen was the first mayor appointed under the Act, and his popularity was so great that he was re-elected mayor for 20 consecutive years, until he was obliged to resign the position owing to the arduous nature of his duties in the Assembly. To this gentleman and to Alderman Thornley, who was elected at the first council meeting, and who is still a member, the progress which has been made is mainly attributable. The Blackwattle Swamp has been filled up by dredgings from the bay and surplus rubbish from Pyrmont and other quarries, and the soil is now being formed from street sweepings, &c., and it is intended to be shortly opened as a public park, having been granted for the use of the public by the Government. About 40 acres of land in the borough, and a large portion of land in the outer Glebe were granted to the church and school estate ; and, as most of the land is now built upon, the rents add considerably to the revenue of the church. According the last census returns the population numbered 5714, and the value of the property for rateable purposes was £469,000 ; there were 21 hotels and 15schools, and about 10 miles of streets. Since then there has been a considerable increase in the number of houses, and the population has about doubled. The present representatives in the town councilconsist of the Mayor, T. J. Dunn, Esq., and Aldermen T. Wearne, C. Field, H. Turner, J. Graham, M. Chapman, W. Bull, M. Carey, G. Wells, A. Thornley, sen., P. C. Lucas, and J. P. Walker. The council clerk and treasurer is Mr. D. J. O'Connor. The municipality is represented in the Assembly by the Hon. Sir George Wigram Allen, Speaker of the House. Glebe is divided from the neighbouring borough by the Orphan Creek, over which is built a substantial structure called the Camperdown Bridge. The two main arteries are Glebe-road and Bridge-road, both of them being long, wide, straight, well-paved streets. A wharf is now being formed at the extreme end of Glebe-road, where the ferry crosses over to Balmain. The ferry at Glebe Point is in charge of a man named Suggett, who has lived there for the past 30 years, and brought up a numerous family in the ruins of an old boat, named the Noah's Ark, on the edge of the bay. Suggett boasts that he has never paid any rent, rates, or taxes, or bought any fuel, and he never in-tends to do so, and defies the council or anyone else to remove him from his position. There are several handsome rows of houses, and pretty villas are springing up in all directions on the borders of the creek and the sides of the bay. There are also several important manufactories carried on in the neighbourhood, and several of the Sydney banks have branch establishments here. The Sydney Tramway and Omnibus Company, who have stables in the Glebe, run their conveyances to and from the city every few minutes. During the last six months 100 new houses have been erected in the borough, and the rates during the past year have increased by £1000. St George's Chapel is the place of worship at Windsor Castle in England, United Kingdom. It is both a royal peculiar and the chapel of the Order of the Garter. The chapel is governed by the Dean and Canons of Windsor. The chapel is located in the Lower Ward of the castle, which is one of the principal residences of Queen Elizabeth II. In 1348, King Edward III founded two new religious colleges: St Stephen's at Westminster and St George's at Windsor. The new college at Windsor was attached to the Chapel of St Edward the Confessor which had been constructed by Henry III in the early thirteenth century. The chapel was then rededicated to the Blessed Virgin Mary, St Edward the Confessor and St George the Martyr. Edward III also built the Aerary Porch in 1353-1354. It was used as the entrance to the new college. St George's Chapel became the Mother Church of the Order of the Garter, and a special service is still held in the chapel every June and is attended by the members of the order. Their heraldic banners hang above the upper stalls of the choir where they have a seat for life. The period 1475-1528 saw a radical redevelopment of St George's Chapel, set in motion by Edward IV and continued by Henry VII and Henry VIII. The thirteenth century Chapel of St Edward the Confessor was expanded into a huge new Cathedral-like chapel under the supervision of Richard Beauchamp, Bishop of Salisbury, and the direction of the master mason Henry Janyns. The Horseshoe Cloister was constructed for the new community of 45 junior members: 16 vicars, a deacon gospeller, 13 lay clerks, 2 clerks epistoler and 13 choristers. St George's Chapel was a popular destination for pilgrims during the late medieval period. The chapel was purported to contain several important relics: the bodies of John Schorne and Henry VI of England and a fragment of the True Cross held in a reliquary called the Cross of Gneth. These relics all appear to have been displayed at the east end of the south choir aisle. The day-to-day running of the chapel is the responsibility of the religious College of St George, which is directed by a chapter of the dean and four canons, assisted by a clerk, virger (traditional spelling of verger) and other staffers. The Society of the Friends of St George's and Descendants of the Knights of the Garter, a registered charity, was established in 1931 to assist the College in maintaining the chapel. The lower ward (bailey) of Windsor Castle in England. St George's Chapel is on the left and the Round Tower is centre right. Image by Joseph Nash published 1848. FUNERALS. THE FRIENDS of the late Mrs. MARY GODDARD are respectfully invited to attend her Funeral ; to move from the residence of her son-in-law, Mr. John Bird,23, Glebe-street, off Bay-street, Glebe, THIS (Tuesday) AFTERNOON, at a quarter to 3 o'clock, and proceed to St. Barnabas Church ; from thence to Camperdown Cemetery. THE FRIENDS of Mr. JOHN GODDARD are respectfully invited to attend the Funeral of his late deceased MOTHER, Mary ; to move from No. 23, Glebe-street, Glebe, off Bay-street, THIS (Tuesday) AFTER-NOON, at a quarter to 3 o'clock, for the Camperdown Cemetery. J. and G. SHYING and CO., 719, George-st. THE FRIENDS of Mr. HENRY GODDARD are respectfully invited to attend the Funeral of his late deceased MOTHER, Mary ; to move from No. 23, Glebe- street, Glebe, off Bay-street, THIS (Tuesday) AFTER-NOON, at a quarter to 3 o'clock, for the Camperdown Cemetery. J. and G. SHYING and CO., 719, George-st. THE FRIENDS of Mr. G. WELLS are respectfully invited to attend the Funeral of his late deceased MOTHER-IN-LAW, the late Mrs. Mary Goddard ; to move from No. 23, Glebe-street, Glebe, off Bay-street, THIS (Tuesday) AFTERNOON, at a quarter to 3 o'clock, for the Camperdown Cemetery. J. and G. SHYING and CO. THE FRIENDS of Mr. JOHN BIRD are respectfully invited to attend the Funeral of his late deceased MOTHER-IN-LAW (the late Mrs. Mary Goddard) ; to move from his residence, No. 23, Glebe-street, Glebe, off Bay-street, THIS (Tuesday) AFTERNOON, at a quarter to 3 o'clock, for the Camperdown Cemetery. J. and G. SHYING and CO., 719, George-street.